Google Translate gives you a Phrasebook in which you can save translated words and phrases. You can view your Phrasebook on your computer or your smartphone or tablet, so if you have words and phrases that you use often in a different language, you can access them from anywhere. 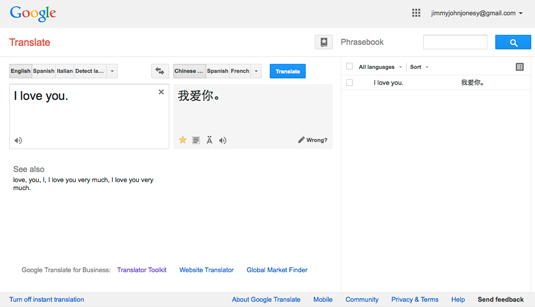 Google Translate’s Phrasebook is fine for remembering various words and phrases that it translates for you. However, if you are traveling and you need an actual phrasebook to help with the language of the country you’re traveling to, Google Translate’s Phrasebook won’t help much — unless you take the time to type in, translate, and save all the phrases you think you’ll need. But why do that when you can get a real phrasebook, either a book or an app for your smartphone or tablet? Luckily, some phrasebook apps are either free or cost only a few bucks. In the box that shows your translation, click the Star icon. The star will turn yellow, and you’ll see the number 1 in a red circle on the Star button in the top right. To view your Phrasebook, click the Star button in the top right. Your Phrasebook displays on the right, showing the phrase you just added (see Figure 1). You can search for a phrase in your Phrasebook using the search field above the list. If you have multiple Phrasebook entries in different languages, you can choose to view All Languages or view a selected language from the drop-down menu. You can sort the order of your entries by Recently Added or alphabetical by the Original Text. You can export your Phrasebook items to Google Sheets (Google’s spreadsheet program that’s part of Google Drive) by clicking the Export to Google Sheets icon at the right. If you hover over a translated item in the list, you’ll see speaker icons next to the original text and the translation. Click the icons to hear the phrases spoken aloud. Figure 1: Google Translate’s Phrasebook in action. Type in a phrase to translate and tap the blue circle with the arrow to translate. In the box that shows your translation, tap the Star icon. The star turns yellow. To view your Phrasebook in iOS, tap the Star icon at the bottom of the screen. To view your Phrasebook in Android, tap the Menu icon and tap Phrasebook. You have the same search, sort, and audio options in the app as you have in a Web browser. Because your Phrasebook is part of your Google account, it stays synchronized whether you’re using it on your computer or on your mobile device.